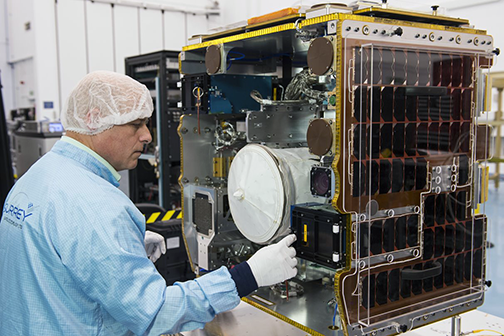 Surrey Satellite Technology Ltd. (SSTL) has successfully commissioned the RemoveDEBRIS spacecraft, which was deployed from the International Space Station on 20th June 2018. SSTL's RemoveDEBRIS, an active debris removal technology demonstration mission. Photo is courtesy of SSTL/Max Alexander. Spacecraft operators at SSTL have just completed a series of tests and operations to confirm the functionality of key operating systems such as power management, communications, propulsion, attitude control and on-board computing, and the satellite is now ready for the experimental phase of the mission to begin. The RemoveDEBRIS satellite was designed, built and manufactured by a consortium of leading space companies and research institutions, led by the Surrey Space Centre at the University of Surrey and co-funded by the European Commission. Sir Martin Sweeting, Executive Chairman of SSTL and Chairman of the Surrey Space Centre, said that RemoveDEBRIS is an exciting and highly innovative mission that has brought together leading space organizations to tackle the issue of space junk. He looks forward to discovering how all four experiments on board the spacecraft perform over the next few months, and he sincerely hopes that the success of this mission will mark a step-change from demonstration to regular Active Debris Removal missions in the future.